Something wonderful has happened. God has graciously interrupted our world. God has come into our lives, to call us back into relationship. God has made it possible for humanity to be transformed, to live in freedom from sin and death. God has made new what once was dead. 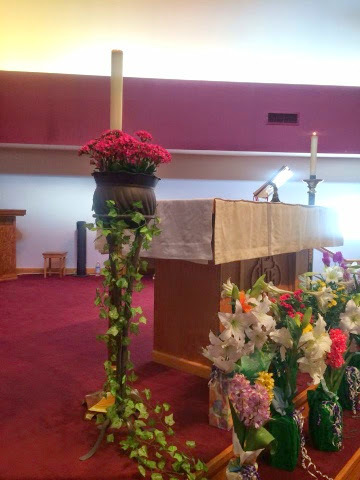 Alleluia, Christ is Risen! Is the acclamation we shout to the world. We have that same problem, we look directly at Jesus and we do not recognize. Incarnation, God with us, Emmanuel, God in the flesh, means that each and every one of us, and all of us as one body, are full of Christ. We are full of Christ because we are full of the divine Love. Madeleine L’Engle said that love means being willing to give up everything in order to be with the subject of that love, as God has done, and the story of our faith remembers. One of Madeleine L’Engle’s most well loved books, A Wrinkle in Time, is being made into a movie. Ms. L’Engle in interviews has said many times that she would not allow her book to be made into a movie if she had to give up artistic control. The issue most important to her had to do with this very idea of love. There were folks earlier that wanted to make A Wrinkle in Time into a movie, but she rejected the screen play because when she opened up the script the first line said, “Love is Power.” Love is not power, love is abandoning power to be with the subject of that love. This is the work that Jesus does. Because God gave up all power to come and live as the powerless, we, you and I, are made new. Because God became one of us, to live, suffer, die, we have new life. This is the love that Christ demonstrated. This divine love is the love that the greatest stories ever told are about. This is the love that enabled God to come to Earth, born of a woman, to live and die as one of us. This is the love that moved God to save us as we could not save ourselves. My friends, God has interrupted human existence, human history. And all that we can do is to try to be to God a fraction of what Christ is to us. A mighty tall order, a dreadfully demanding task, but one that we are called to do none the less. That is what being full of Christ is, being full of that love. We are called to be overflowing with love for all people. Love without fear. Love without demanding something in return. Love even if you cannot possibly get along with them. Love your neighbors and your enemies as yourself. Be overflowing with love as you turn the other cheek. Our problem is that we tend toward sin. Christ was perfect, but we are not. We are not perfect, no matter how hard we try. No matter how many miles we run to stay slim, no matter what brand of make-up we use, no matter how closely we follow the teachings of the Bible. And that is why Christ died for us, a perfect sacrament for the whole world. Christ died and is risen so that we could live in freedom and new life now, and with God in eternity. Christ died and is risen so that we don’t need an invitation into paradise. Christ has done the work, our job is to respond in a new way. We are Easter people, we live in the truth of resurrection. What does resurrection mean to you and to me in our daily lives? This isn't about resuscitation, like when paramedics are able to revive someone who has had a heart attack. The something wonderful that happened 2000 years ago, continues moment by moment for us. That truth is revealed by the stories Jesus’ followers told and eventually recorded, That truth is evidenced by the centuries of people who have lived their lives breaking boundaries as Jesus did, and that truth is made known by you and I.